Was your college experience filled with late nights studying and chowing down on microwaved Ramen? I definitely know mine was and although it was not necessarily the healthiest choice, it sure was the tastiest! 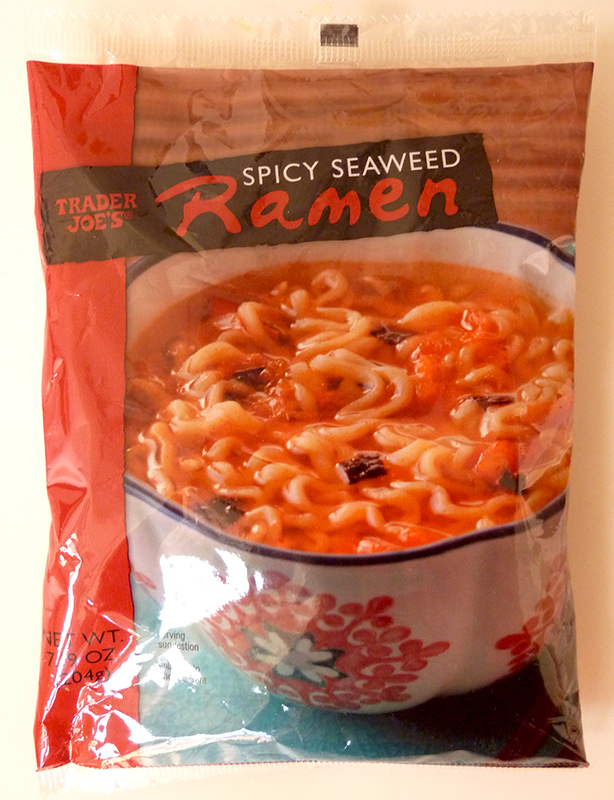 Recently Trader Joe's just stocked their shelves with Spicy Seaweed Ramen. As the name implies this soup will bring to the table bowl a mild spicy flavor with bits of seaweed floundering around an array of perfectly cooked noddles. Just like the old school Ramen, Trader Joe's Spicy Seaweed Ramen comes accessorized with its own spiced vegetable packet filled with dried seaweed and dried kimchi. Feel free to play around with the amount of water you add depending on your broth preferences. A side note, if you have a gluten, soy, wheat, clam, shrimp or anchovy allergy and/or are sensitive to salt, then definitely stay way from this delicious treat. If you have none of the above, definitely keep these stocked in the pantry as they make a great rainy day/cold evening treat!